Whether you are planning to have an intimate wedding or an exorbitant one, The Regenza by Tunga will surely match your unique choice, budget, and requirements. With a capacity of accommodating up to 75 in seating and 350 in floating, the venue has a cosy and comfortable interior for the guests. It also offers an in-house team of caterers that puts all the efforts to delight the guests with mouth watering multi-cuisine dishes. The Regenza by Tunga, Vashi, Navi Mumbai, stands proud as one of the few luxury hotels in Navi Mumbai. 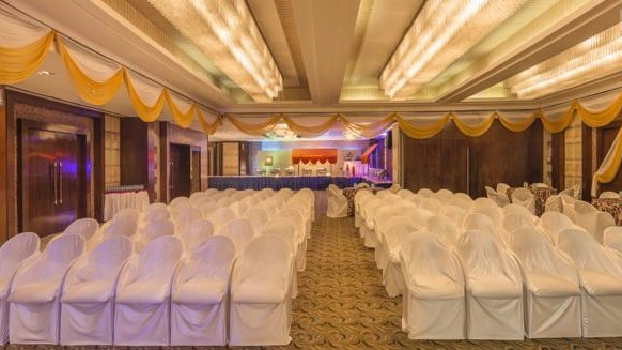 Built over an expansive area, the swanky hotel has two beautiful banquet areas: Ebony - decked out in gold, cream and mahogany and fitted with crystal chandeliers; perfect for a large reception or your wedding pheras and Primrose - with its sleek, modern decor works best for smaller functions like sangeets or your mehendi ceremony. The management at The Regenza by Tunga also look after the food and decor, which helps you enjoy the day to your fullest.